Four months ago, the internet world went crazy over a video of three little girls who were bored with a princess show on television. Armed with sundry toys, Barbie dolls and everything else that even remotely resembled a shade of pink, the girls went about building a Rube Goldberg a�?Princessa�� machine where the goal was to switch the TV off a�� all to the tune of a modified version of Beastie Boys song Girls playing in the background. The commercial for fledgling toy company, GoldieBlox, had nearly eight million views on YouTube before it was pulled down over a legal dispute about the ada��s music. A second video of the same commercial, a 30-second Super Bowl spot, has nearly two million views and is still counting. Another ad, released for Easter, garnered more than 2,80,000 views in eight days. An engineering graduate herself from Stanford University, Sterling loved building and making things as a child a�� from small forts to giant sugar packet towers at restaurants that drove the waitstaff crazy. But studying engineering wasna��t the 30-year-olda��s idea; that credit goes to her high school calculus teacher. And as Sterling herself admits in a TEDx speech she gave in 2013, her idea of an engineer was a�?someone who fixed train enginesa�?. a�?I knew I liked math and science, so I took a chance and enrolled in Mechanical Engineering 101 in my first semester. I soon realised it was an incredible outlet for creativity and innovation a�� I was hooked,a�? she says. Sterling goes on to explain that she was one of very few women in class at University, one who almost failed a 3D drawing class. She realised that (like hundreds of other young girls) she had spent her time playing with dolls and makeup that did little to improve spatial skills, unlike construction sets or buildings blocks. 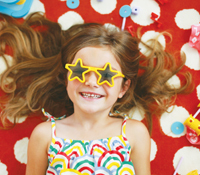 a�?Girls tend to lose interest in math and science as early as age eight, and if you take one look at any pink toy aisle youa��ll understand why. Girls are encouraged to play with dolls and taught to host tea parties, while boys are given construction kits, puzzles and brainteasers that develop spatial skills,a�? she says passionately. Playing with building blocks, and figuring out how one piece fits into the other are exactly the skills that later support learning STEM subjects (Science, Technology, Engineering and Mathematics). This pink-aisle, blue-aisle conundrum is a big marker for telling us just how products are marketed differently for girls and boys a�� all the dolls, make up kits and cooking toys in one section, while the doctor sets, construction toys, Lego, building blocks in another. And that is why, with the toy world populated by Jimmy Neutrons, Bob the Builders and Sid the Science Kid, Goldie leads female role models in the science section for young kids. There are certain contradictions, of course. On one hand, Goldie isna��t your typical nerd. She is quirky, with mismatched socks and gold shoes. On the other hand, she isna��t a princess, but is skinny, blonde and cute, and comes packaged in a�?princessya�� purple and pink. Feminist bloggers have been quick to point out that one of the toys, GoldieBlox and The Parade Float, is princess-themed. Sterling says that GoldieBlox is her contribution to a�?disrupt the pink aisle and give girls more than dolls and princesses.a�? 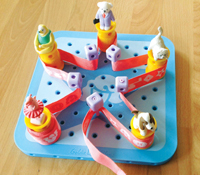 The toys tell the story of Goldie, an engineer who has to solve problems by building simple machines. There are no instruction manuals. Instead, there is a book that narrates the problem and how Goldie is going to solve it. The toys marry the verbal with the spatial. In November, Slate.com featured a blistering setdown of the toys and Sterlinga��s attempts to a�?disrupt the pink aisle,a�? and Time Magazine ran a piece in February titled The War on Pink debating the best way to get girls interested in science and maths through toys a�� to get them hooked by going the princess way or completely gender-neutral? While the economics of such gender-segregation in toys is notably huge, some toy designers and child psychologists point out that the gender-specific marketing has tuned the adults into thinking exactly the way companies want them to a�� insisting that boys cannot play with dolls and that girls love being princesses. Children start to pick up on such prejudices and biases when theya��re as young as two and half years old, says Dr Jaishri Ramakrishnan, consultant psychologist at Billroth Hospitals, Chennai. a�?When youa��re being constantly told that since youa��re a girl, your toys are in the pink aisle, thata��s what youa��ll grow up learning. Only if someone tells you otherwise, will you be able to start questioning the idea, and maybe outgrow it,a�? she says. Agreeing with Ramakrishnana��s point of view, Suhasini Paul, one of Indiaa��s first global toy designers (her PinkElefant design company has designed toys for the likes of Pogo, Thirdwave Science Toys and Frank) says viral marketing and peer pressure play a big role. a�?It is parents who think there is gender-segregation when it comes to toys for girls and boys. One of the first things they notice in a toy is whether it is pink or blue, and then they choose accordingly. They need a clear cut demarcation,a�? she says. And yet, she observes, the a�?princess culturea�� is largely relegated to Barbie dolls in India and even these are somewhat expensive for the average household. Indiaa��s rich background with respect to folk toys is another reason why the princess culture hasna��t fully taken root yet. But how long is it going to be this way? In Sterlinga��s arsenal of marketing techniques is a figure that worries most parents a�� of all the engineers in America, only 13 per cent are female. a�?Whata��s worse, engineering and technology are the fastest growing fields in todaya��s economy, so women are not just under-represented, theya��re being left out of the conversation altogether,a�? she says. Leta��s hope she inspires others like her to create gender-neutral toys that introduce little children to big ideas. as a mission-based company,a�? says the young entrepreneur. One reason the videos went so viral is the fact that there hasna��t seemed to be anything like GoldieBlox in the publica��s recent memory a�� a toy specifically aimed at young girls to get them interested in engineering. Veteran toy designer Arvind Gupta, who aims to teach maths and science to young children through his project Toys from Trash, agrees with the assessment. Gupta conducts frequent workshops for school children through his toys and he says that he faces the same skewed ratio problem in his workshops that Sterling faced at her university. a�?One of the prime reasons why we dona��t see many women in intensive engineering courses is because they arena��t exposed to the idea in the first place!a�?says the toy maker, who, with his team, has so far uploaded more than 4,000 YouTube videos detailing how his toys can be made. A vehement supporter of bringing down the Barbie dolls-for-girls stereotype, Gupta points out girls have equally loved his a�?action toysa�� in his four-decade-old career as a toy maker. a�?They need to have an equal shot at building spatial recognition skills,a�? he says. a�?Who says they cana��t be both princesses and engineers?a�? Sterling, a follower of Tina Roth Eisenberga��s design blog called Swiss Miss and TechCrunch, spent months of research and consulted specialists in the industry to learn about childrena��s cognitive development and their motor and spatial skills a�� including Harvard neuroscientists and educators. She found that boys loved building, while girls had an inherent desire to nurture, but also loved engaging, interactive toys. They needed a story to keep them engaged. After much testing (which included some unintentionally creepy Craigslist ads for babysitting only girls), Sterling came up with a prototype of GoldieBlox. The parents loved it, the girls loved it but toy companies werena��t buying the idea. 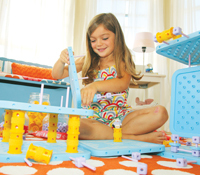 Sterling turned to crowdfunding platform Kickstarter to raise funds for GoldieBlox. She needed $1,50,000 in four weeks to fund an initial order of 1,500 toy units but ended up making that amount in the first four days a�� and her minimum production ended up being over 20,000 units. She made more than $2,50,000 during the four-week campaign. 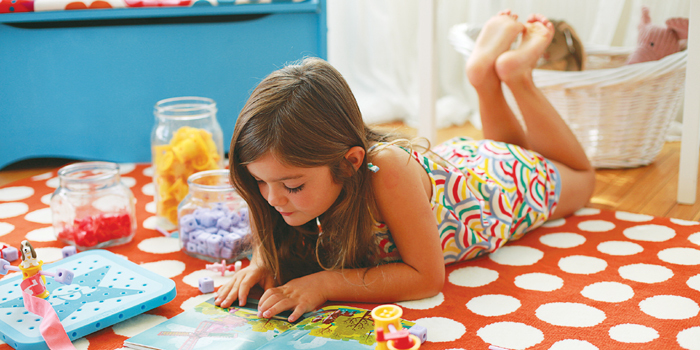 Available on Junglee.com, GoldieBlox comes as the Spinning Machine for children over six (`1,764), the Parade Float (`1,281) and the Dunk Tank (Rs. 1,266) for four to nine years.